The Groovy Swing Console allows a user to enter and run Groovy scripts. This page documents the features of this user interface. The Console has an input area and an output area. You type a Groovy script in the input area. When you select Run from the Actions menu, the console compiles the script and runs it. Anything that would normally be printed on System.out is printed in the output area. If the script returns a non-null result, that result is printed. The Groovy Console supports several options to control classpath and other features. 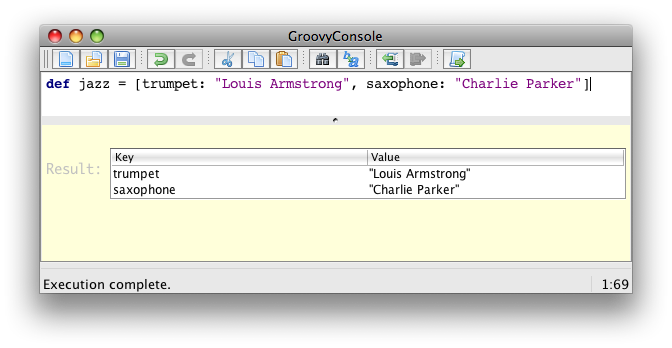 The Groovy Swing Console allows a user to enter and run Groovy scripts. Ctrl+Enter and Ctrl+R are both shortcut keys for Run Script. If you highlight just part of the text in the input area, then Groovy runs just that text. The result of a script is the the value of the last expression executed. You can open any text file, edit it, run it (as a Groovy Script) and then save it again when you are finished. You can pop-up a gui inspector on the last (non-null) result by selecting Inspect Last from the Actions menu. The inspector is a convenient way to view lists and maps. The console remembers the last ten script runs. You can scroll back and forth through the history by selecting Next and Previous from the Edit menu. Ctrl-N and ctrl-P are convenient shortcut keys. The last (non-null) result is bound to a variable named _ (an underscore). The last result (null and non-null) for every run in the history is bound into a list variable named (two underscores). The result of the last run is [-1], the result of the second to last run is __[-2] and so forth. The Groovy console is a very handy tool to develop scripts. Often, you will find yourself running a script multiple times until it works the way you want it to. However, what if your code takes too long to finish or worse, creates an infinite loop? Interrupting script execution can be achieved by clicking the interrupt button on the small dialog box that pops up when a script is executing or through the interrupt icon in the tool bar. However, this may not be sufficient to interrupt a script: clicking the button will interrupt the execution thread, but if your code doesn’t handle the interrupt flag, the script is likely to keep running without you being able to effectively stop it. To avoid that, you have to make sure that the Script > Allow interruption menu item is flagged. This will automatically apply an AST transformation to your script which will take care of checking the interrupt flag (@ThreadInterrupt). This way, you guarantee that the script can be interrupted even if you don’t explicitly handle interruption, at the cost of extra execution time. Once the console is launched, you can use the variable values in Groovy code. Groovy Console can visualize the AST (Abstract Syntax Tree) representing the currently edited script, as shown by the screenshot below. This is particularly handy when you want to develop AST transformations.